While many depictions of the events surrounding President Abraham Lincoln’s assassination exist, most are artist renditions, created well after the fact. As of April 14, 2016, visitors to the Ford’s Theatre campus may now see the only known artistic representation of the Lincoln assassination created by an eyewitness. We are honored to commemorate the 151st anniversary of the Lincoln assassination at the historic site with the addition of a very special artifact in the Ford’s Theatre Museum. Early in the morning on April 14, 2016, curators installed a very special painting by artist Carl Bersch entitled Lincoln Borne by Loving Hands. The painting is displayed in a specially-constructed exhibition case which is fully enclosed and climate-controlled, allowing us to keep the painting on long-term display. The specially-constructed case, ready for the oil painting to be installed. Photo by Heather Hoagland. Lincoln Borne by Loving Hands is a very large oil-painting—just over three-feet high by five-feet wide—and it is the only depiction of the Lincoln assassination created by an eyewitness. German-born artist Carl Bersch immigrated to the United States in 1861—just as the Civil War was starting. He lived in a boarding house on Tenth Street in Washington, D.C., and made his living as a portrait artist in Baltimore and Washington, D.C. Bersch became a U.S. citizen in 1866, the year following the assassination of President Abraham Lincoln. 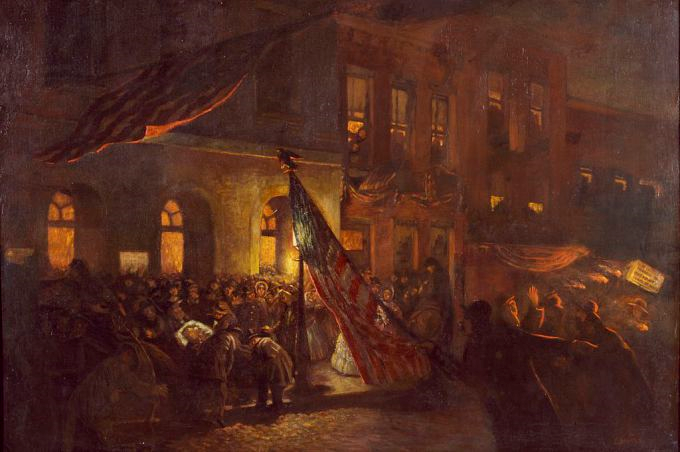 On the night of April 14, 1865, the 30-year-old artist was on his balcony, across from Ford’s Theatre, and was sketching a torchlight procession that had made its way down Tenth Street as part of the city-wide celebrations marking the surrender of Robert E. Lee to Ulysses S. Grant—the beginning of the end of the Civil War. Suddenly, patrons rushed out from Ford’s Theatre proclaiming that President Abraham Lincoln had been shot while attending a performance of Our American Cousin. Bersch was perfectly positioned to watch as soldiers carried the unconscious President Lincoln out of Ford’s Theatre and onto Tenth Street, where nearby resident, Henry Safford, beckoned the men to carry the wounded president into the Petersen boarding house and into a back bedroom. There, Lincoln would die at 7:22 the following morning. Bersch captured the remarkable streetscape on his sketch pad and later painted the scene in oil on this large canvas. Oil Painting of Mortally Wounded Abraham Lincoln Moved from Ford's Theatre. "Lincoln Borne by Loving Hands" by Carl Bersch, before its 2015 conservation work. Photograph in the Carol M. Highsmith Archive, Library of Congress, Prints and Photographs Division. Bersch’s daughter, Carrie Fischer, kept the painting for many years, loaning it in 1932 to the Lincoln Museum (today’s Ford’s Theatre Museum), where it was publicly displayed. His granddaughter, Gerda Fischer Vey, donated the painting to the White House in 1977, and it entered the National Park Service collection shortly thereafter. Except for brief periods of display, most recently in Russia in 2011 at a Moscow museum as part of an exhibition that compared Lincoln and Czar Alexander II, the painting has remained primarily in storage and was in need of conservation. 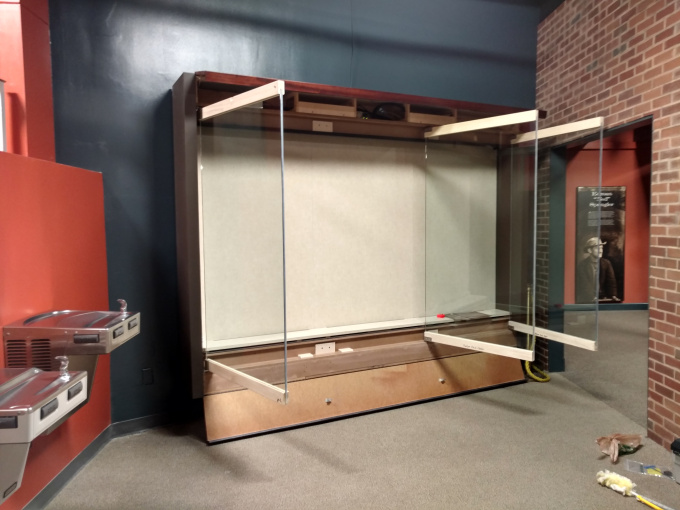 In 2015, our National Park Service partners arranged for the much-needed conservation work as well as a fully-enclosed case that would allow for the display of the piece. Conservator David Olin was hired to work on the painting and, over the course of six months, painstakingly removed decades of dirt and varnish, and stabilized the painting for exhibition. Installing the painting within the Ford’s Theatre Museum on April 14, 2016. Photo by Heather Hoagland. While the conservation work went on, NPS staff turned a corner of the Museum near Booth’s deringer and the displays of Lincoln’s suit and the treasury flag from the Presidential Box, into a small construction site. For more than a month, NPS and an exhibition fabrication firm named ColorAd worked to move a water fountain from the concrete wall, paint and finally install the exhibit case that provides protection to Bersch’s unique painting. 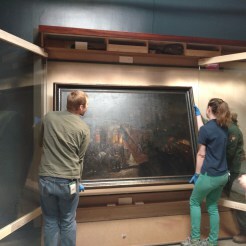 Just in time for the 151st anniversary of the Lincoln assassination, the painting returned to Tenth Street, where it will receive the attention it deserves from the hundreds of thousands of visitors who come to Ford’s every year. Plan your own visit to see Lincoln Borne by Loving Hands at Ford’s Theatre on Tenth Street at the Ford’s Theatre Museum. Heather Hoagland is former Exhibitions and Collections Manager for Ford’s Theatre Society. She holds an M.A. in Museum Studies from The George Washington University. Follow her on Twitter @HLHoagland.